News — DPSS Lasers, Inc.
DPSS Lasers now Integrating Higher Power UV Laser Solutions & Fully Automated Systems. See us at Interphex 2018! Santa Clara, Calif., March 7, 2018– DPSS Lasers, Inc. (Santa Clara) is now integrating higher power UV Laser solutions and offering fully automated systems for an array of new applications. The Samurai UV Laser and marking on the fly system will be publicly displayed and demonstrated at the Interphex Show at the Javits Convention Center from April 17-19, 2018. DPSS Lasers Inc’s booth is #1932. Since 1998, DPSS Lasers has specialized in manufacturing DPSS, 355 nm, UV laser markers, and low cost UV lasers with high peak powers and repetition rates that are ideal for marking and engraving materials such as HDPE, ceramic, plastics and metals. By utilizing the 355 nm wavelength, the Samurai provides a small spot size and large depth of focus. UV lasers take advantage of a “cold” marking process that does not require high average power levels and allows damage-free marking on many materials. Higher Power UV Lasers and shorter pulse widths are now be integrated - UV lasers with average power levels from 1 - 55 Watts are now being integrated, as well as nanosecond, picosecond and femtosecond UV lasers. If there is a UV application need, DPSS will be able to integrate it for the customer. Santa Clara, Calif., December 8, 2017 – DPSS Lasers, Inc. (Santa Clara) is pleased to announce a partnership and collaborative effort in the ongoing fight against counterfeiting, production overrun and grey market trading, with iTRACETechnologies, Inc. iTRACE has integrated its 2DMI product security technology with DPSS Lasers to deliver a turnkey marking solution to authenticate products against counterfeit and track Diversion into the Grey Market. DPSS Lasers specializes in manufacturing DPSS 355 nm, UV lasers and UV laser markers (trade name Samurai)with high peak powers and repetition rates that are ideal for marking and engraving a variety of materials. By utilizing the 355 nm wavelength, the Samurai provides a small spot size and large depth of focus. UV lasers take advantage of a “cold” marking process that does not require high average power levels and allows damage-free marking on many materials.The integration with iTrace allows new and existing DPSS Laser customers to leverage the Samurai laser marking system in their production process to seamlessly apply the secure iTRACE 2DMI brand protection technology. DPSS lasers can reliably apply the iTRACE 2DMI marks in an overt and covert application providing secure Unique Identification (UID) to every part produced in an area as small as 350 microns. "DPSS Lasers has been a long term trusted partner for iTRACE and has helped bring iTRACE to the forefront of two Factor Product Authentication technologies." said Mark Manning, Founder and CEO of iTRACE Technologies. iTRACE and DPSS have spent many hours lab testing and fine tuning the setup of the two technologies to ensure the most reliable covert marking on many material surfaces including plastic, polycarbonate, aluminum, stainless steel and more. 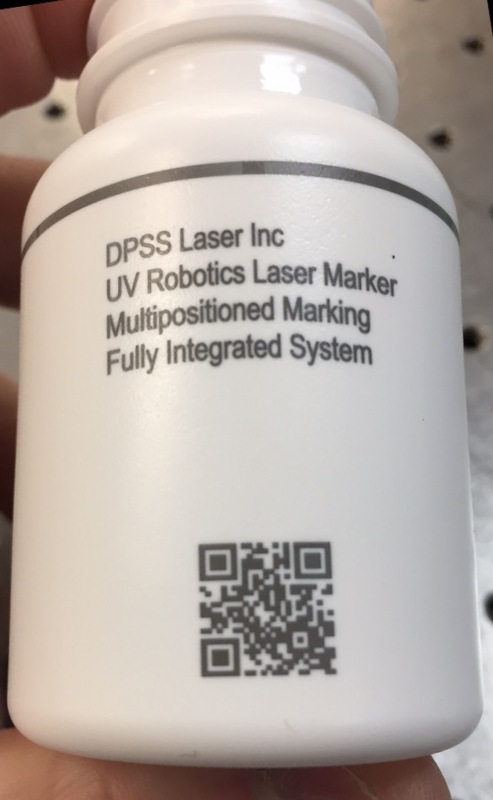 “As a vector code, the iTRACE 2DMI mark is much faster and easier for lasers to apply than other UID technologies” said Randy Kimball, VP of Business Development at DPSS Lasers, "being a proprietary technology also allows iTRACE 2DMI to be much more secure and provides additional layers of protection not achieved by barcodes, QR codes and Datamatrix technologies." DPSS Lasers is now offering fully integrated UV Laser marking solutions for our customers with multi-axis robot arms. The 6-axis robot arm is capable to work with complex geometrical shapes and a variety of part sizes. While still utilizing all of the benefits of cold-laser marking, the UV Laser is achieving a permanent mark on the material in a hands-free, batch process. This is perfect for marking alpha numeric text, data matrix barcodes, and sequential numbering of parts.